Loved the decor; the staff were very friendly from the check-in Desk, to the Door Greeters, to the housekeeping staff. Made our visit to LA and to the conference in which we were attending a very pleasant experience. We had a wonderful experience at The Mayfair. The property is historic and beautiful. The employees are so friendly. You can tell they enjoy their work. We can't wait ro visit again. Thank you Mayfair! It was great service and awesome location. The people are very good with anything you need for your room. The staff was very friendly. I love the decor and the art work featured . Beds were comfortable. The white walls need to be touched up a bit since there were black streaks along the wall of our room. Also the panel on the step up towards the our window was falling off the step. But we had a beautiful city view. The toilet seat was slightly broken as it moved side to side . We only stayed 1 night. We didn’t really hang out in the room since we had plans on going out. Basically a place to sleep,shower and get ready. Awesome lobby, good bar in the back, rooms are a little tight but still quite livable. My overall experience was above average, except the fee for the valet parking, $40 a Day!! It felt like a slap in the face. Overall good. My husband and I were going to an event in downtown LA that night, so just wanted somewhere easy to crash. This hotel was perfect. Very nice. Cool vibe. The lobby and bar were very pretty. Would stay again and would recommend. The rooms carpets are very dirty. They need to be shampooed after each guest leaves. They place a 400 dollar hold on your credit and release it once you checkout. I went downstairs to speak with someone about the room and they said the only thing they can do is vaccum. They have waters in the room that arent complimentary. I had a staff member ask.if I wanted free water and they charge me for it later. The overall location is not in the best area, but is a nice location if you came to see a Lakers game. Possibly wouldnt stay there again. Nice hotel with pleasing decor, coffee machine didn't work properly and the air conditioning wasn't adjustable. Super small bathroom, but hotel was pretty trendy in feel. Bathroom sink was a bit clogged. Room needs at least one bedside lamp. Room had a funny odor. Nice hotel but rooms need to be updated. Twas nice staying at Mayfair,I just don't want that the sheets wasn't changed.I saw a strand of hair on the bed,by the pillow case.. The staff was lovely, the coffee shop was incredible, and it was close to downtown. I'm excited to return when all the amenities are available, but even with out them, it was a great stay. There was a strong cleaner smell from the bathroom. We had to request an air fresher. The rooms are a decent size and have basic amenities. The rooms could use a fridge though. Located in Downtown Los Angeles, The Mayfair Hotel Los Angeles is within a 5-minute walk of Good Samaritan Hospital and within 15 minutes of other popular attractions like Los Angeles Convention Center. This 296-room, 3.5-star hotel has a restaurant along with conveniences like free in-room WiFi and a 24-hour business center. Enjoy a bite to eat at Eve American Bistro, the hotel's onsite restaurant. You can get a quick energy boost at the coffee shop/café. Start weekends off right with cooked-to-order breakfast served for a fee. An LED TV comes with digital channels, and guests can stay connected with free WiFi. Beds sport premium bedding and the bathroom offers a hair dryer. Other standard amenities include a coffee maker, free local calls, and an ironing board. Limited housekeeping is available. 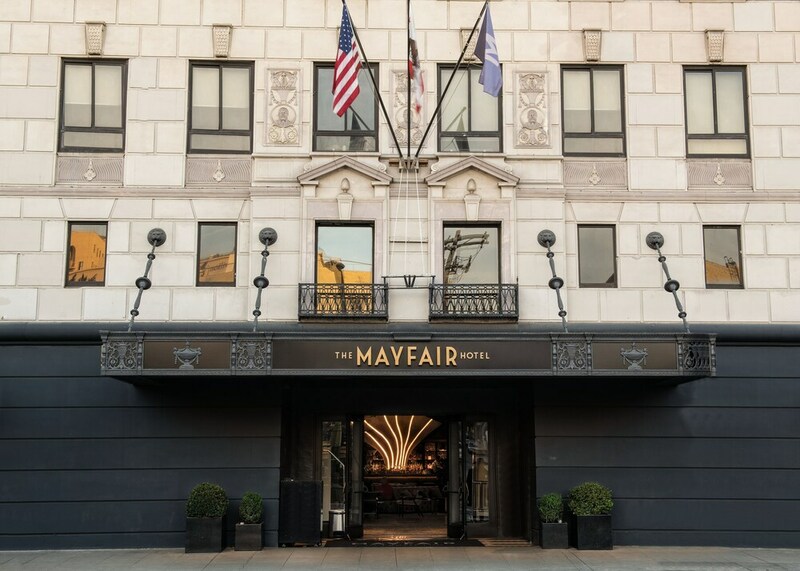 Renovated in 2017, The Mayfair Hotel Los Angeles offers free WiFi in public areas, a 24-hour business center, and express check-out. Valet parking is available for USD 36 per day, and there's also limo/town car service. Multilingual staff at the front desk are standing by 24/7 to help with dry cleaning/laundry, luggage storage, and concierge services. Other amenities at this historic hotel include an ATM and a porter/bellhop. Your support is greatly appreciated. I'm very glad to hear your stay was pleasant. Your feedback is very important to our efforts to continuously improve guest satisfaction: we strive to do the best job we can, and reviews like yours make it all worthwhile. Thanks for staying with us. Apologies for the experience. We will be working on improving on the issues mentioned. We appreciate your feedback! Thank you for staying at the Mayfair Hotel. We are glad to hear you enjoyed your stay. Cooked-to-order breakfast is served on weekends for a fee. Eve American Bistro - Restaurant and bar specializing in American cuisine. Open select days for brunch, lunch, and dinner. M Bar - Bar. Open daily. Fairgrounds - Coffee shop. Open daily. The preferred airport is Los Angeles, CA (LAX-Los Angeles Intl.). The front desk is open 24 hours a day, and checking out is easy with express services. Driving? This property offers valet parking (fees apply). The minimum check-in age for Spring Break is 21 years old.